Obviously, in the course of the last few weeks, writing about everything that is going on has fallen to the wayside. But I still want to document it all, if for no other reason than so I remember it all later! So here is a roundup of all of the details I haven’t written about so far. I have found much inspiration from the Offbeat Bride site, as well as collecting images on my Pinterest board. Photography is a super important part of a wedding, and having been to a number of weddings where the photography has been either amazing and very well coordinated, or interruptive and distracting, I knew this was important. 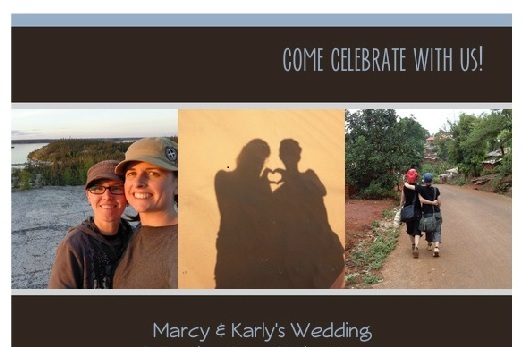 For M and I, as a lesbian couple and neither of us in love with having our pictures taken, we needed someone who would make us feel comfortable, while leaving us with great pictures at the end! I was really pleased that a book club friend of mine, who photographed another friend’s wedding (while also being a bridesmaid! ), agreed to be our photographer. Having someone we know makes us both feel more comfortable, and we love to give someone we know the business. Shari Riley Photography. Similar to the photographer, we would have really liked to have someone close to us be the officiant. It is such an intimate yet public thing, saying marriage vows in front of your family and friends. Unfortunately, unlike in much of the US, it is not legal in BC for a friend or family member to get ordained to perform a wedding. But as a second best option, the mother of one of my oldest friends is a judge, and she offered to perform our ceremony. So although it is not a close friend or family member, at least our officiant is a woman, and has at least known me for a long time. She also had some lovely selection of vows, which was perfect for us, who wanted something personalized but didn’t feel up to the task of writing our own. Here’s what I was looking for: eco-friendly, purple flats. My partner is 5 feet tall, to my 5’6″, so heels were out of the question. Purple is our signature colour – M is wearing a eggplant-purple shirt. And of course, eco-friendly, which generally meant I was looking for recycled or low-impact matarials, vegan, and locally made. It turns out, this was a fairly tall order. I even just started looking for any old purple flats, and came up empty handed. The only eco-friendly shoe store in Vancouver is Nice Shoes, and they had nothing that came close. M did get her wedding shoes there, though. With some trepidation, I turned to the internet. Luckily, I stumbled across the perfect shoes. 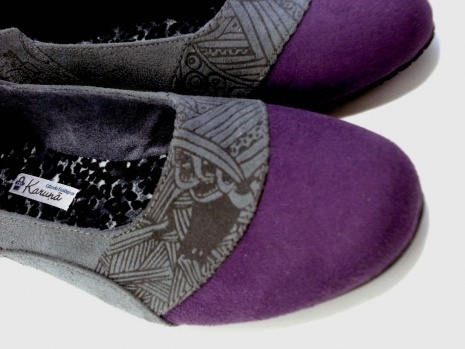 Karuna Shoes, although not local, are vegan, eco-friendly, the soles are made of recycled tires, and are hand-screened. The small company is in Columbia, and they were very helpful through email, and the shoes arrived in great shape and in lots of time! This was my chance to be a little bit funky. First came the earrings, which M found at a fair trade store in Gibsons. Recycled wire bicycles will hang from my ears, matching a pin on her vest. My necklace was sourced at Make It! 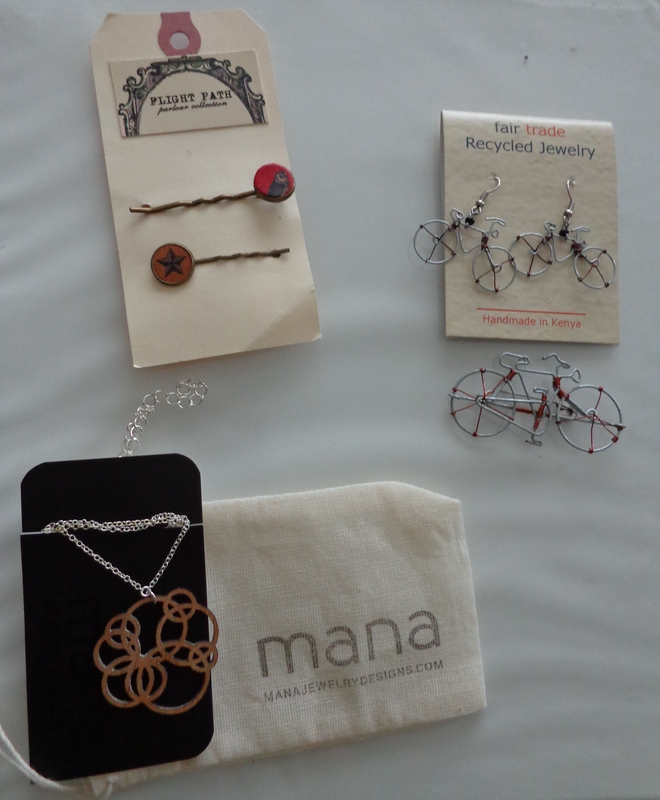 Vancouver, a local craft fair, and is made of wood by Mana Jewelry Designs. I also found some hair pins at Make It!, vintage style, by Flight Path Designs. I may not be the most coordinated of brides, but I love it all! This is the piece I am perhaps most nervous about. To save some costs, and also because the venue doesn’t boast a giant dance floor, we decided to put together our own playlist for the wedding. We have tried to get the right mix of new and old, upbeat dance and slow music, with hits from the 80s and 90s that will hopefully appeal to our 30-something friends, classic oldies for the parents, aunts and uncles, and some recent pop for the clubbers and 20-somethings. Given the venue, still not sure if people will really dance, but hopefully with enough beer in them, it will happen! I am now only a few days away from the Big Day. Out of towners start arriving tomorrow. Although I feel confident that things are together, the part of me that hates event planning is still sweating the details. Mostly, I just want it all to be fun, for M, for me, and of course, for the 55 friends and family joining us this weekend. Bring on the party! The hinge in the wedding planning was where it was going to happen. Two main considerations for choosing our venue: environmental considerations, and simplicity. Luckily, the two go hand in hand. We also worked with a tight timeline, about 5 months in the planning process. We wanted to pick a local business, with a preference for a local brewery, since beer is going to be a main staple of our reception. We also wanted somewhere central, and close to a place we could host an outdoor ceremony, to reduce the driving that people will do to get there. Somewhere that will take care of all aspects – food, drinks, decoration, AV, etc – reduces the transportation costs of bringing those things in. And a place that looks nice in itself won’t require decorations and flowers, things that are produced just for one day, and then discarded. Also, somewhere with good vegetarian food options was key. Neither my partner nor I are the type to go crazy for the trappings of weddings. Decorations? Nope. Seating chart? No thanks. Flowers? What for? All of those details just make planning the event work, instead of fun. So it was important to us to find somewhere that would take care of as much of the details as possible, without that becoming crazy expensive. Finding a place that just looks nice all on it’s own is key, and that provides as many of the details as possible, just reduces our stress about things we don’t care about. Although I may have loved having an outdoor wedding at a farm, in the end, having to deal with things like catering, chair/tent rentals, liquor licenses, transportation, and everything else just wouldn’t make it worth it. We were keen to have our ceremony outdoors. Both M and I are outdoorsy types, and, at least to me, it just seems right to say our vows outside, in a park. But we didn’t want to have to deal with people driving to one location, then driving to another (bad carbon footprint! ), or renting some kind of bus to move everyone along. The ideal was somewhere that had both a reception location and ceremony venue within walking distance. We also want to keep the ceremony short and simple, with guests standing and no walking-down-the-aisle. 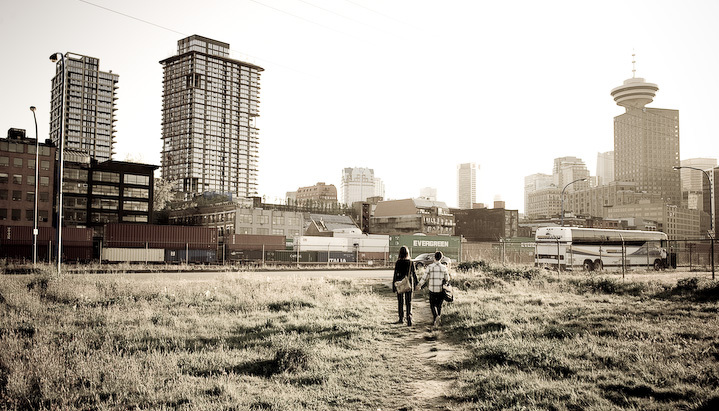 After some wandering, exploring, and a pub crawl in Gastown (I know, the hardships), we narrowed it down to two locations. Granville Island Brewery was a fantastic option, which would have been funky and allowed us to get all sustainable, veggie catering from Savoury City, but unfortunately, their liquor license currently restricts them to 6 such events per year. So we’ve ended up at Steamworks Brewery, on the edge of Gastown. 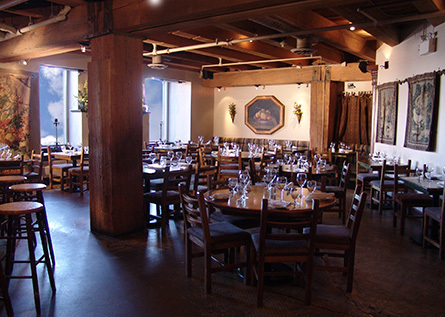 Although Steamworks’ veggie menu was limited, the event manager worked with us to provide an all vegetarian menu, with a few vegan options, and is a local brewery. 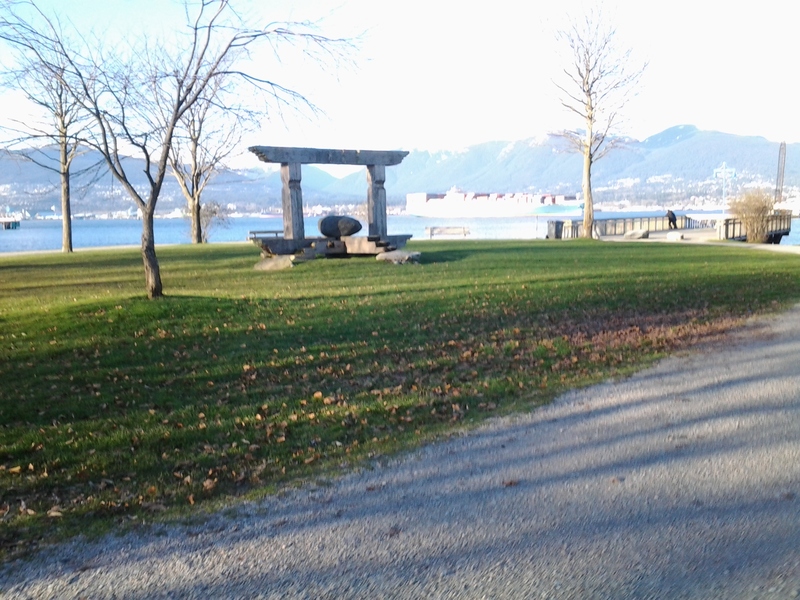 A 5 minute walk (through Waterfront station) will connect us to Crab Park at Portside, an oceanside park in the city with great views of the mountains and city, where we will have our ceremony. In our invitation and follow up directions, we have encouraged our guests to take transit where possible. Although I have no idea how many of them will take me up on it (I take buses to other people’s weddings, but I may be in a minority), we made the venue accessible by being very central. Also, parking is expensive downtown Vancouver, so hopefully that discourages people! Most of our out of town guests are staying at a hotel across the street. Although I do think that we could have found somewhere that fit our bill a little better, I think we’ve done a pretty good job in keeping with what is important to us. I will work on keeping waste low by hopefully limiting straw use! One of the things we’ve used to keep things simple is to keep the timeline between announcement and wedding short, about 5 months of planning. Which made eco-friendly invitations an easier sell. I’ve heard all the arguments against e-invites. “Tacky.” So what? We’re not doing this for someone else’s satisfaction. “What about people who don’t use email?” Well, if those people exist, you can send that one person a card (or call them). But I personally don’t care about paper cards or invites, and had zero interest in paying a bunch of money for an inherently wasteful product. Spend it on food and drinks, that’s what will be remembered anyway! Some advice about e-invites. Shop around to find a good option. We started with evite, which is great for party invites, but is just a bit too casual for this. We ended up using Pingg because it had nice options, and a good RSVP system. We also opted for the $10 upgrade to get rid of ads, because that is pretty tacky, and we’re not that cheap. So far, haven’t had any complaints. At least not to my face. I’ve always loved weddings, I have to admit. Not all the trappings that go with it – the flowers, the decorations, dresses, bridal showers, maids of honour, etc – but just the simple fact of people coming together to celebrate the love two people have for each other. But, like I said, I dislike most of the details that come along with it. As an environmentalist and a person generally abhorrent of waste, I don’t fully get the need to spend huge sums of money on one day, with all the accompanying garbage created. And, as a self-confessed introvert, I’ve never been super keen on that walking-down-the-aisle, centre-of-attention thing. To top it off, my partner is a girl. So, to say that we fall into the non-traditional category would about sum it up. So how do we plan our perfect wedding? Eco-friendly, as waste-free as possible, low cost, and true to our characters? There aren’t a lot of examples to follow out there (certainly not when I Google it, anyway), and we don’t have any friends or family that have blazed this trail before us. Although I hadn’t caught the bug, wedding planning finally introduced me to the fun of Pinterest, where I try to visualize what ours might look like. I almost hate to admit it, but I got excited about the idea of the dress. This was my opportunity to get exactly what I wanted – eco-friendly, locally designed and made, and not worry so much about the cost. I wasn’t looking for traditional, and yet for some reason, I wanted it to be sort of white. I explored local designers, including great stuff from Nicole Bridger, and checked out some vintage stores. But in the end, I went with local eco-designer Pure Magnolia. It was a perfect match for me.